A tasting of wines from 12 NZ wineries for consumers. Its a good concept I must say when local singapore wine distributors of NZ wines come together to offer wines from different regions in NZ. It gives consumers a reason to spend more than an hour or two at a tasting (which usually happens if a local distributor showcases wine from just a particular winery alone). I particularly like the 'Walkabout' wine tasting to be held on 3 Nov. Its from 10am to 5pm, showcasing wines from all 12 wineries and complimented with tapas. You get the opportunity to meet the folks behind these labels, interact with them, get to know their signature approach in making wine and managing respective labels. A whole day affair ! From North Island you have Kumeu River, Villa Maria, The Milton Vineyard, Craggy Range, Ata Rangi and Palliser Estate. This gives you wines from Auckland to the north to Martinborough to the south. (Its good to see wineries from North Island being represented as in present times consumers tend to recall and gravitate more easily towards wine regions like Marlborough and Central Otago, giving the wine regions in the North Island a miss). From South Island you get Neudorf Vineyards (Nelson), Nautilus Estate (Marlborough), Lawson's Dry Hill (Marlborough), Fromm Winery (Marlborough), Pegasus Bay (Christchurch) and Felton Road (Central Otago). Again a good spread from different regions in South Island. If you are a fan of NZ wines, then this is a wine event tailored for your curiosity. Eight more days to the Singapore Wine Fiesta 2012. This year its held between 2-4 Nov 2012. Like last year, the event is once again held at the Customs House (near Fullerton Bay hotel, closest mrt station being the Raffle Place station). Having attended the one held in Singapore last year, I must say I am looking forward to visit the upcoming one. Article on Wine Fiesta 2011. 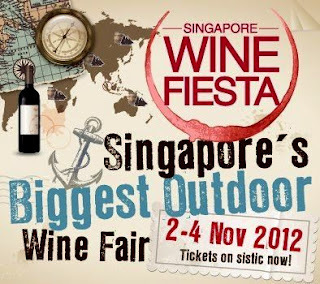 Singapore Wine Fiesta 2011 Photo Album. The event last year showcased old and new world wines, provided wine enthusiasts an opportunity to interact with wine producers and had a casual, fun-filled atmosphere about it. The early part of each day was quieter and less crowded. If you are a wine student or enthusiast keen to interact with wine producers and ask questions on wine, terroir and the wine making process, then I would suggest you come a little early. For the upcoming event, you get the opportunity to taste around 200 labels; that's a pretty good number :) Tickets are going at $38 for each day's tasting and I hear there are some promotions on tickets offered to members of The Straits Wine Company and DBS/POSB cardholders as well. Do visit a Straits Wine Company's retail outlet and find out more.